With only about 5000 tourist visiting per year, North Korea is probably one of the least travelled countries in the world. Journalists are not allowed in and we get very little inside information on what it really looks like and how people live. 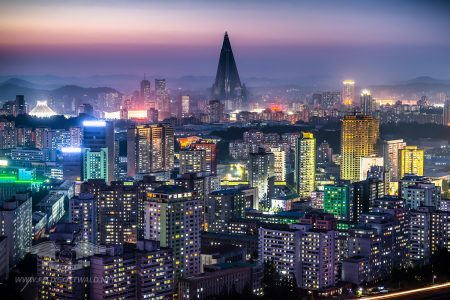 I am therefore extremely happy to be able to show you what the capital city of Pyongyang looks like at night. Naturally there are images of its must-see sights (and must-see means a visit is compulsory as directed by the state), but also a few of ordinary people. Surprisingly or maybe not, they are very much like us and pretty normal, even though their surroundings might not be. 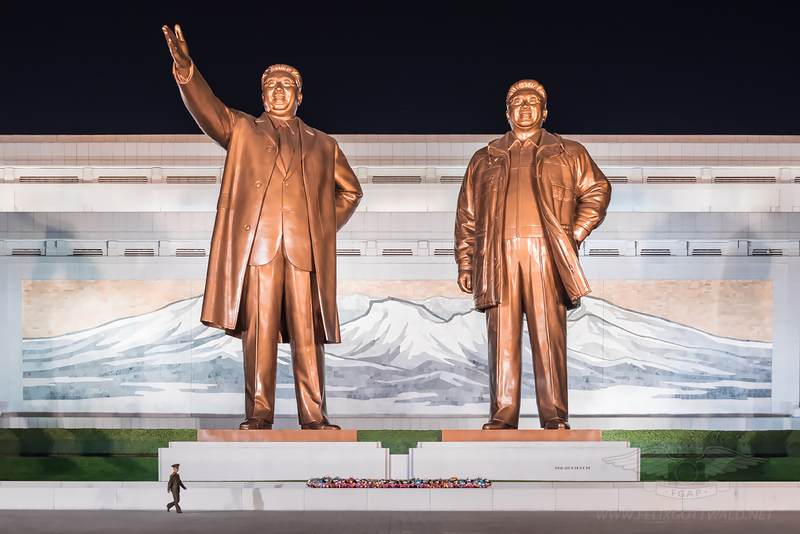 There is one thing you cannot get around when visiting the DPRK (Democratic People’s Republic of Korea, which is North Korea): The bronze statues of the eternal president Kim Il Sung and his son and successor dictator Kim Jong Il. 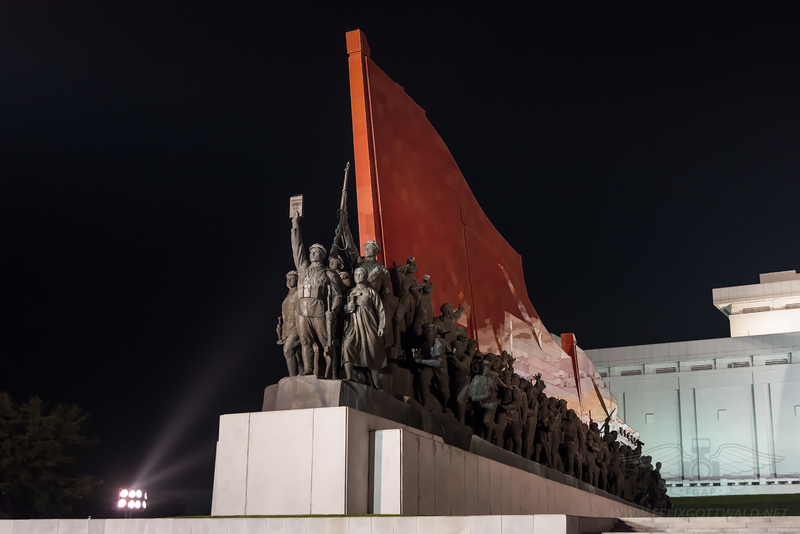 Visiting their monument which is known as the Mansudae Grand Monument is usually the first thing a visitor will have to do when coming to Pyongyang in order to pay the two former leaders respect. Procedure dictates that flowers are being laid-down and one has to bow in front of the statues. This act is also repeated in front of statues of the two in other cities or museums… Tourist groups should be maintaining strict order and there is no wandering around by yourself. 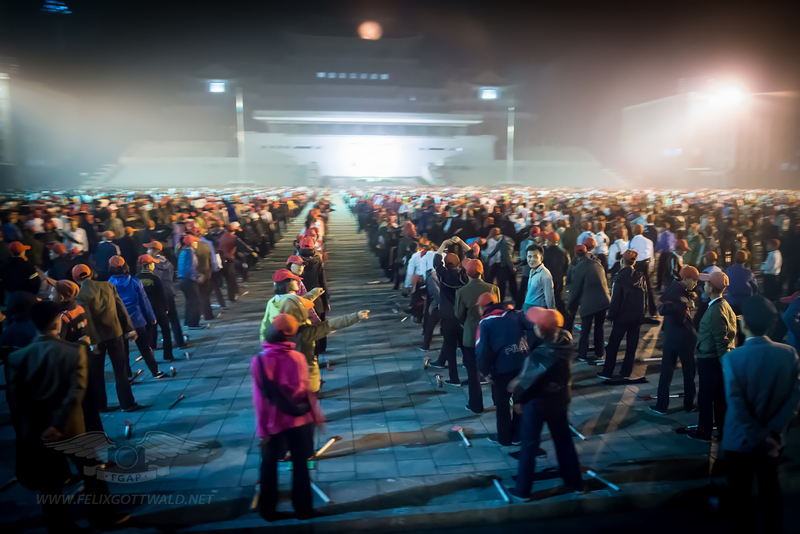 North Koreans don’t have to be told that, as they usually march in rank and file anyway when in larger groups. Another very important order to follow is that you will never cut off any part of the Kims when taking a picture – there are no detail photos or close-ups allowed and you will only take photos of the whole statue. Any further questions? North Korea first “president” Kim Il Sung’s (left side) face expression was changed few years ago from a rather serious to a smiling face to go along with the new statue of his son (right) that was erected in 2011 after Kim Jong Il died. While the latter first wore a long coat at first, this was quickly changed to his signature parka. The memorials are 50 meters high – just look at the small soldier walking in front of them to get a feeling of how big they actually are! The monument doesn’t stop at putting two massive bronze statues in front of a giant wall picture of Mount Paektu (click here to see the images of my Ilyushin Il-62 flight on Air Koryo to the Mt. Paektu area) that is a symbol for the Kim dynasty and the Anti-Japanese struggle before World War II. 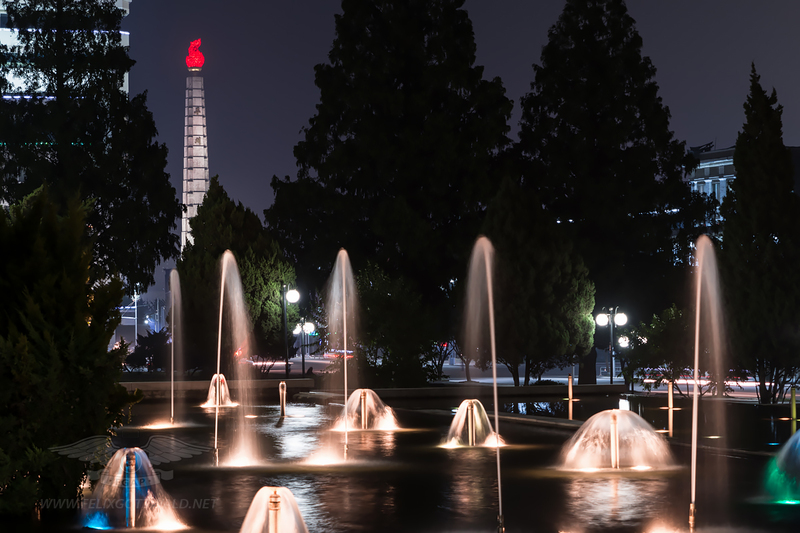 It is flanked by two giant monuments that display the socialist revolution and it’s heroes (left side), as well as the historic struggle of the Korean people against their Japanese occupiers (right side). The Romans have one, the French have one and the Mexicans have the biggest, so why not North Korea? That is what the Supreme Leader Kim Il Sung might have thought in the early 1980s so he had his own Arch of Triumph errected at the Triumph Return Square. It is 3 meters taller than its Paris counterpart, but only the second tallest in the world… Reports say that there are observation platforms and elevators, but we haven’t been able to go inside and I doubt these are accessible at the moment. 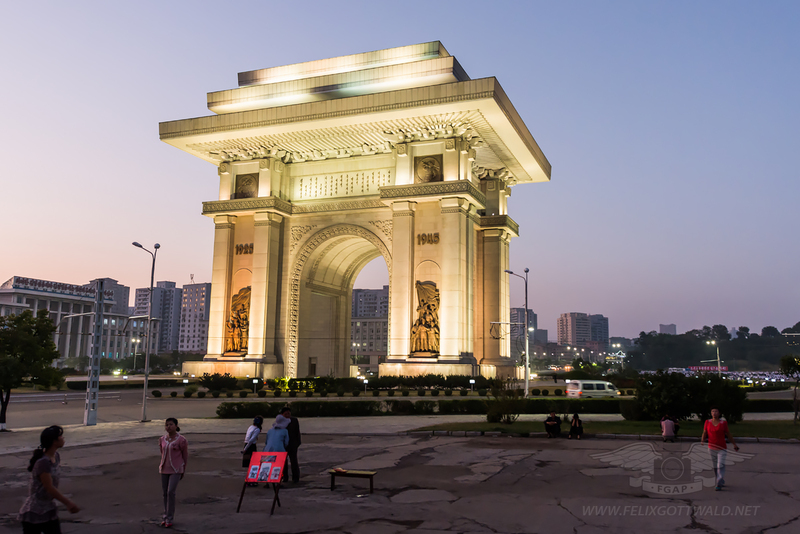 You can’t miss the Arch of Triumph as it is located on the road from the airport to the city centre. The year 1925 inscribed on the left marks the start of Kim Il Sung’s struggle against the Japanese and 1945 the “liberation of the Korean people” from the occupiers. 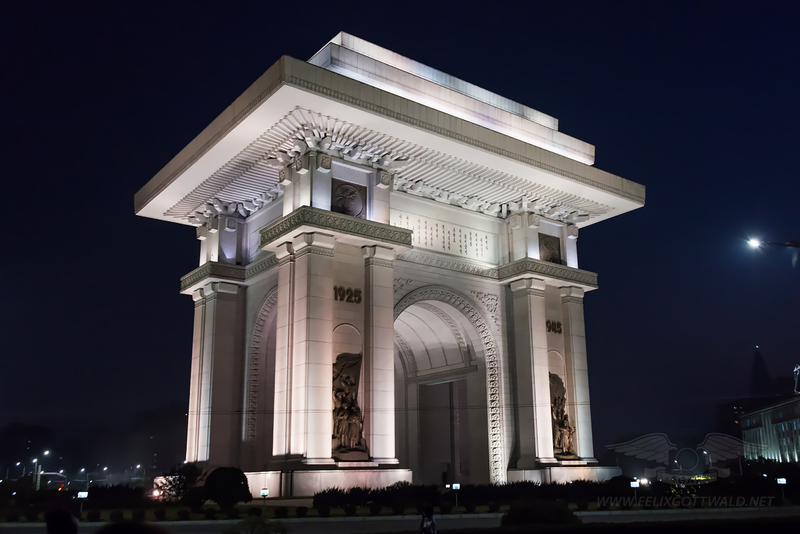 Inscribed in the upper part of the arch is a excerpt of the “Song of General Kim Il Sung“. Gladly the North Koreans do not live in a dictatorship dominated by one family, but a Democratic People’s Republic! 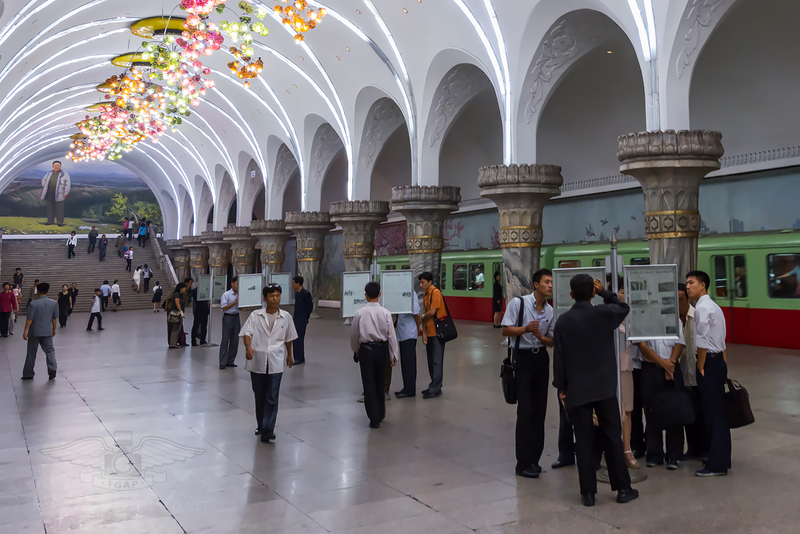 Located right next to the Arch of Triumph is the Kaesŏn stop of the Pyongyang Metro. I would not have noticed the entrance from the outside. That is what the Metro looks from the inside! There will be a dedicated Metro post on this website as well. As you will know, The Workers’ Party of Korea (WPK) is celebrating its birthday on 10 October and there will be huge celebrations. 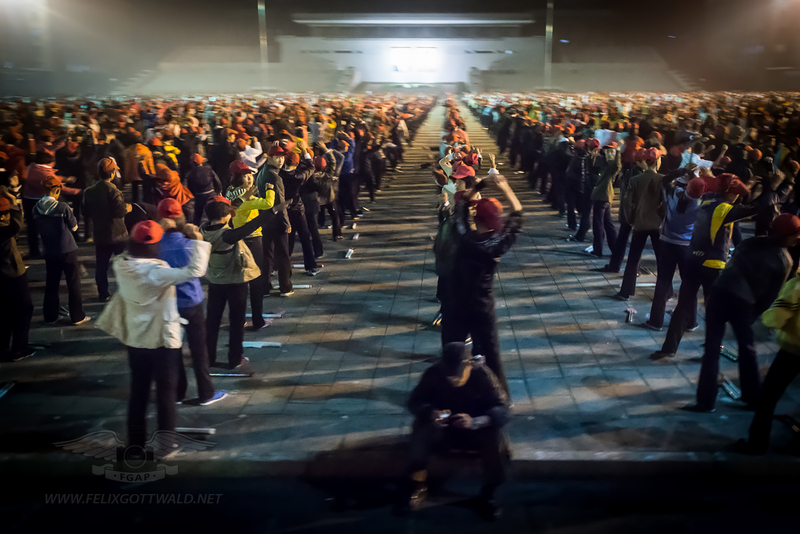 Everyone is already very excited and people have been impatiently wanting to practice the mass rallies where they would be marching nicely in formation. After their nightly practices some of them grab a quick snack and a drink at the local stalls. 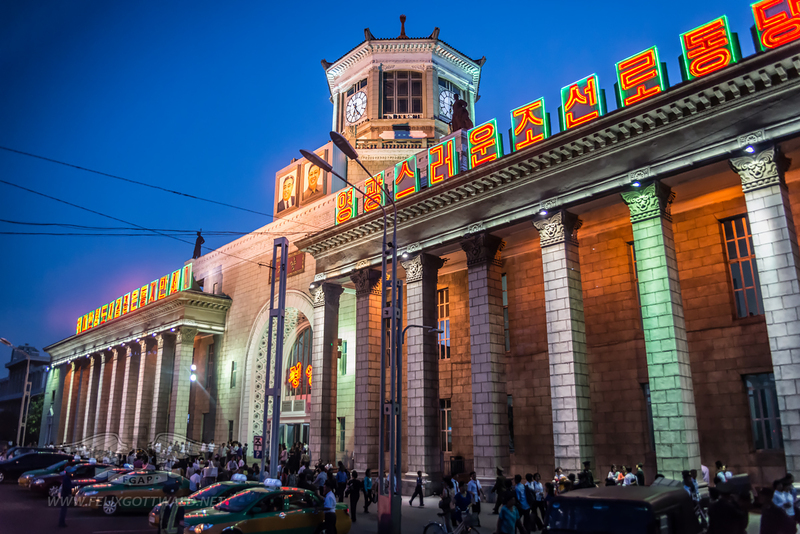 The central train station in Pyongyang connects the capital to most cities in the country, as well as Beijing and Russia. 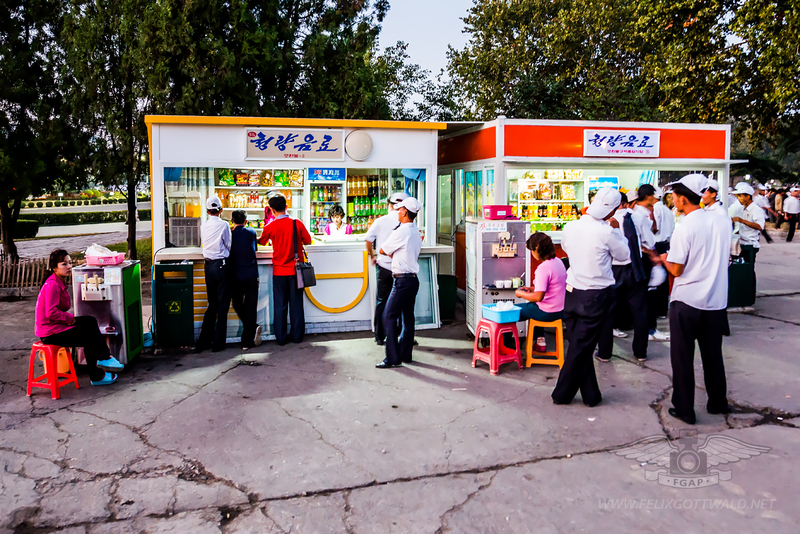 A line to Seoul exists as well, but it currently terminates at the North Korean border town of Kaesong. 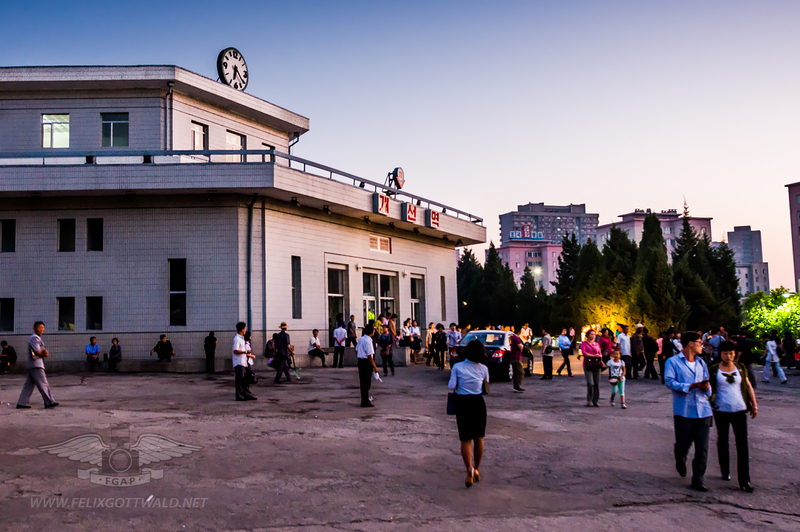 According to Wikipedia the station has five platforms and ticket counters exclusively for government employees (so far to equality of people in the DPRK). While the original structure was built in the 1920s, the station was then destroyed in the Korean War and rebuilt in the typical Soviet-socialist style architecture of the time, which I personally like, as it has a very distinctive charm. Also note the number of modern taxis in front of the station! However, according to local information the kilometer costs 2 USD, which is obviously not affordable to regular North Korean citizens. You have probably noticed the beautiful and multi-colored fountains in the foreground of the picture. 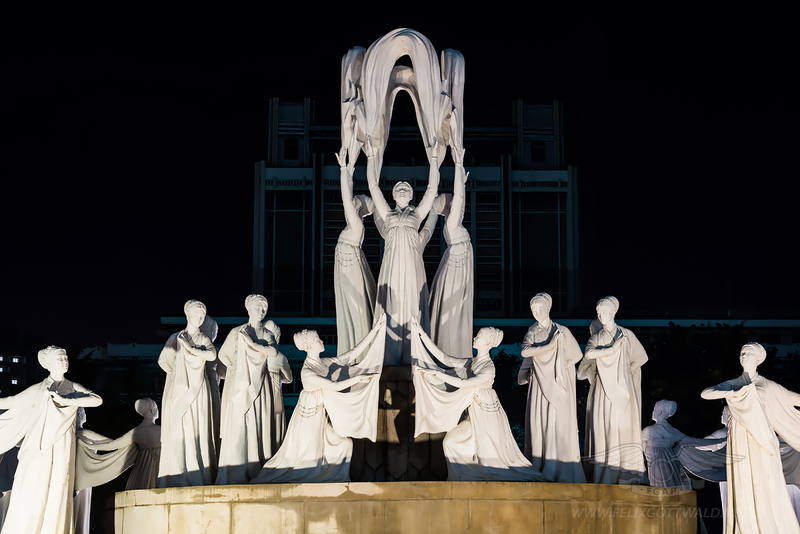 They are part of the Mansudae Fountain Park. I will not waste any more words and allow you to take in the beauty of it. On the last picture you can also see the Juche Tower in the background. 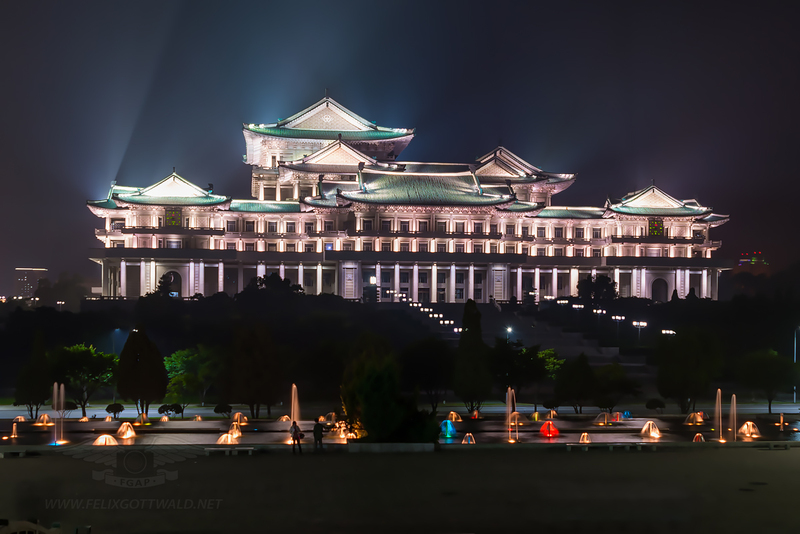 We stayed overnight in the Yanggakdo Hotel on a small island in the middle of the Taedong River. Fortunately my room was located in the 4th floor and I had an amazing view on the city. I love panoramic shots and I hope you will like this one as much as I do. You can clearly see the Ryugyŏng Hotel in the background which is shaped similar to a pyramid – it was a very ambitious building project in the early 1980s, but was never finished. Rumor has it that an Egyptian company is now working together with North Koreans to finish the interior and open its doors in the next couple of years. Please note that all images on this site are uploaded in lower quality than the originals in order to save your internet connection some bandwidth. If you are interested in getting any of these photos as a print or digital copy, please get in contact with me and I will be glad to make you an offer.